Then I saw him steering my direction and I promptly reorganized my reading materials and my carry ons into the overhead bin and under the seat in front of me. He was polite enough and I was too tired to converse so it was a while before I recognized the synchronicity that was unraveling. I don’t remember how the conversation began but my ears caught fire when I heard, “I am interested in Indigenous peoples’ worldviews and their use of ecosystem resources to maintain health and wellness, particularly plants and fungi used in traditional medicine.” Seriously? “Yes, I was in Péru studying food security amongst the Quechan population.” I immediately looked over both shoulders to see who the jokester was that had turned this guy loose on me. This was Dr. Eduardo Jovel, a professor at the University of British Columbia and an ethnobotanist in the faculty of Land and Food Systems. He was in Péru with a graduate intern studying food systems of the native people that ranged from food diversity and how increased economic security can affect the consumption of processed foods. I, on the other hand, was in Péru on more of a spiritual quest while paying attention to all of the foods being cultivated and consumed along the way. Dr. Jovel talked about his clinical and scientific research. I told him about my social experiments looking at the capacity to eat well (healthy and local foods) within a food stamp allocation and the idea of conducting a crock-pot camp to support busy families in their quest to be eat more nutritious meals. He mentioned other fascinating work like examining plants that have mercury chelation properties. I shared my knowledge of a cultural biologist in my community who has contributed to the preservation of heritage foods and is sometimes called the father of the local food movement. We conversed about Community Supported Agriculture. Seven hours later as our flight touched down in Houston, I hadn’t slept a wink but felt like I’d be engaged in conversation with an old friend. Despite what I’d learned from Eduardo, perhaps the real lesson was to be open to this type of synchronicity. Although I did meet my husband on a United flight 21 years ago, I don’t interact with all of the good people that come across my path everyday and the truth is, I have something to learn from everyone. I’m sending Dr. Jovel a link to this post and am hopeful that I can stay up to date on his Péruvian project and his other research. And who knows where that might take us because after all, our paths crossed for a reason! It was pretty amazing, wasn’t it Debbie? of your experience with this brilliant scientist on heritage foods in community that can reach across the miles to effect on all. There are few accidents and your encounter is a blessing to us all. I can hardly wait for more information. Will do Sally. He’s in your neck of the woods so maybe one day…. Yes, Paula. Péru was an amazing opportunity. It is a beautiful country full of striking natural and man-made wonders. I found the people very genuine also. What a wonderful experience, Tammy! I’m so happy for you! And I really believe that life arranges these special encounters for us – two people crossing their ways, maybe just once in a life, and go their own ways again afterwards, but richer than before. You must be open to interact, though, because life only makes paths cross, the rest is up to you. That’s the lesson Kath. It’s not really about food and land systems at all. It’s being open to those situations that we encounter. Would love to know you in person! I guess! That sounds awful but glad you have a friend from it. What a very very cool story. This idea of synchronicity – I think it’s real, and very much something we need to tune into and be open and observant when it is happening. I probably miss out on it all the time, though. Especially on airplanes, where I generally want to be left alone! These topics and ideas you sprout here on your blog are fascinating. Perhaps Bradley. I think that we do tend to miss out on this type of synchronicity all the time and so, our quest is to take time to be still and watch for those things. What an amazing coincidence. It sounds like the magic of Machu Picchu was working in your life! Dr. Jovel’s work is so interesting–I can see why you chose to speak with him and forego sleep. Probably even deeper synchronicity Renee – regarding the magic of Machu Picchu. I’m hopeful that I can stay in touch with him. FABULOUS! I do believe we are all in one another’s lives for a reason, only mostly it’s not as clear what the reason is. So glad you were awake, in all senses of the word! Perhaps still unclear on the reason but over time, it will reveal itself! I had not had a chance to hear about this conversation. I am so excited for you and for your readers. Life really is so full of miracles –even when we are tired and not open to them–they knock you right along the side of the head and make you wake up to the unlimited possibilities life offers. Thanks for sharing this magnificent story and for joining me for some mystical and magical adventure in Peru. I would do it again in a heartbeat Bonnie! What an amazing piece of luck that was! and what an ending to your trip! Enjoy the journey . . . as the path unfolds before you. I love the stories of our intersecting lives—it is synchronous, and for many reasons: some known, some not. but it is a constant source of wonder–and joy—when we encounter these powerful ones, such as yours with Eduardo. and now, you have shared that connection with all of us! Let me know if you want me to email a few to him. That’s what they told me before I left – we’ll see! Lovely. Thanks for the pic. I sooo want to go to there. Thanks Ollin! You need to! I may be going a little off topic here, but I have to note that the opening of your post struck such a chord. I was in a group on Wednesday and we talked about how plans are made to go one way but life intervenes and perhaps takes one on a dog leg from the original plans Or a serpentine. Or a sharp veer. It’s just amazing that you ended up in these seats, both of you. What a story! BTW, just finalizing plans to travel out to your neck of the woods end July/beginning of August. Scottsdale then Santa Fe for the opera. My first trip. So very excited! Great Jane. I will likely be here and it will be HOT here so be prepared for the extreme. Santa Fe at that time will be lovely though. I haven’t been to the opera there but I have been to the facility – it’s lovely. Everything is just great in this post : the Machu Picchu in the early morning, your very pleasant journey back home thanks to an unexpected encounter and all you have known and experienced in such a short lapse of time. Thank you for sharing, Tammy. Thanks for your visit Isa! Machu Picchu was a magical place. How nice and interesting. I enjoyed the reading! You visited in the country in which I visited many times when I was young. There I first time interested about the popular music played on the whole Western coast of South America called – Cumbia music. I fall so much in love with Peru and its Indians that my daughter is called Inca. She is proud about her first name and was the first one in Finland who was called Inca. Few years ago she was teaching in Santiago de Chile and there she found own street “Camino de Inca”. 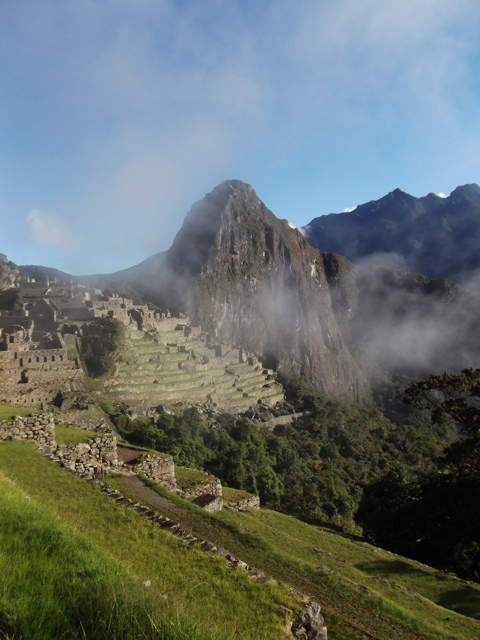 Did You walk the Inca Trail? Tammy, this thrills me – I love when we are totally thrown off our mamby-pamby courses so we can experience a gift beyond measure. What a fabulous photo. Your spiritual quest fascinates me. I sincerely hope that Dr. Jovel is able to influence a curtailing of rampant diabetes that persists in aboriginal ranks in our province of BC. That is certainly his specialty Amy. That is so cool that he sat next to you, really talk about fate. I am so glad to hear you had a wonderful trip and the photos are amazing. Glad to share them LouAnn. Some day I would love to be there also. Thanks for the photos. You’re welcome Linda – and from the looks of your blog, you’re going to start having some more time on your hands! Those sort of chance encounters are often the best. That sounds like one of the best 7 hour trips a person could take. Lucky for you. I hope you do. It’s an amazing place.